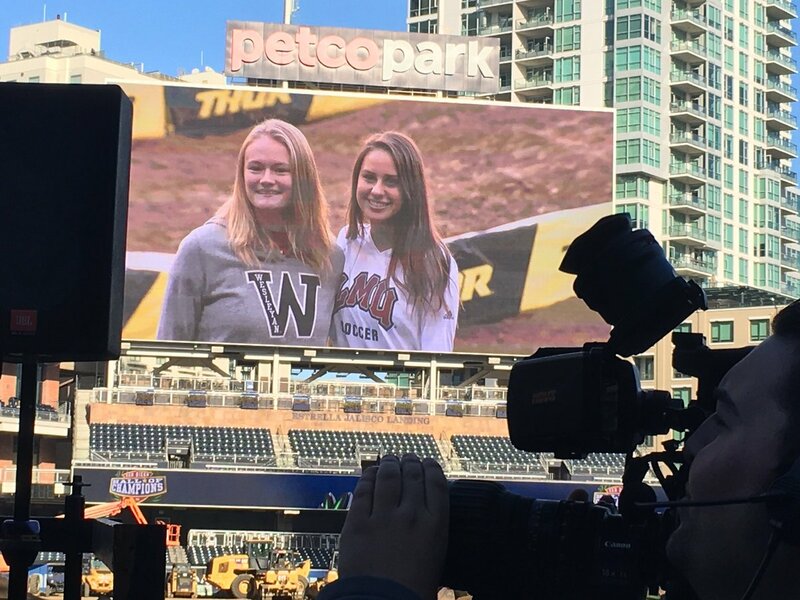 Steele Canyon soccer stars SELAN CROTTY and JALYN LUPO are shown on the screen at Petco Park Tuesday. 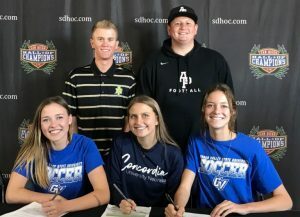 It was a big day in San Diego as 181 athletes from various sports such as football, softball, baseball, boys and girls soccer among others all converged to Petco Park for the 9th annual National Letter of Intent Day put on by the San Diego Hall of Champions. Out of the 181 athletes from around San Diego, 41 of them come from the EastCounty of which 15 are from Helix High school which is the most in the EastCounty. Every sport was pretty much represented by Easterners. The 6’3” 235 lb. 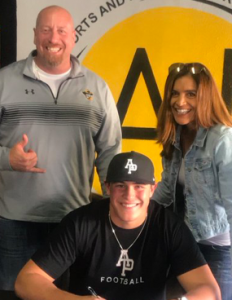 senior really stepped up for the Vaqueros when starting quarterback Wick Hauser went down with an injury as he threw for 866 yards and 3 scores this year inked his way to a football scholarship to Division II Azusa Pacific University where he will play for Victor Santa Cruz and the Cougars. Olivieri’s true strengths are as a defensive player, tight end, and long snapper. The Cougars play in the GNAC Conference. Isaac Taylor Stuart transferred from Saint Augustine this past year and was the most celebrated recruit in San Diego probably since Reggie Bush. Stuart had multiple offers as he was considered the fastest high school player in the country decided to take his massive talents to the University of Southern California. He will be one of the most hyped incoming Trojans in a long time. 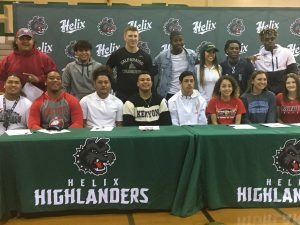 Helix athletes sign their letters on Tuesday in La Mesa. Matthew Avi’i a 6’2” 255 lb. senior offensive lineman was a part of the reason why the Highlanders were able to make it all the way to the State Championship game this past season. For his efforts, he was able to parlay his talents to a football scholarship to Morningside College where he will play for the Mustangs who play in the GPAC conference and are an NAIA school. Fletcher Christian a 6’3” 228 lb. senior tight end and defensive end another big part of the Highlanders has parlayed his talents into a Division I Football Championship Subdivision (FCS) scholarship to Valparaiso to play for the Crusaders who play in the Pioneer league against the likes of USD. William Payne a 6’2” 265 lb. defensive lineman and offensive lineman has made his way to Dixie State which should be renamed East County State as Payne isn’t the only Easterner to sign with the Trail Blazers who play in the Rocky Mountain Athletic Conference in Division II. Robert Rojas, just like his teammate Payne, has signed a scholarship to Dixie State. Jayden Tauanu’u a 6’0” 180 lb. safety, who this past season intercepted 3 balls and had 6 passes defended, has parlayed his talents into a scholarship to Ferris State to play for the Bulldogs, who play in the Great Lakes Intercollegiate Athletic Conference of Division II. Arturo Torres a 6’0 265 lb. OL and DL after showing his skills has inked his way to Dixie State where he will join his other teammates. Isaiah Wooden, who stands at 5’8” and is 165 lbs., this past season caught 52 balls and scored 18 touchdowns which included 4 returns. He will also join fellow teammates at Dixie State. Manny Zamoum who played fullback this past season will take his talents to Concordia University who plays in the Mideast League of the Mid-States Football Association in the NAIA. Terrance McIntyre after an excellent season getting plenty of work and touchdowns in Helix’s prolific offense, will take his talents to Western New Mexico who play in Division II. Briana Reed who is a part of the current Highlander team that is tied for first place in their side of the league has signed a scholarship to Mid America Nazarene to play for the Pioneers who are an NAIA school. Adiva Joseph will take their talent to La Sierra University on a Volleyball scholarship. Isaiah Mann will take his football talents to Kenyon College. Geziel Jajo will run on a track scholarship at Ottawa University. Claire Watkins just like her teammate is a big reason why the Highlanders are tied for first place and next season she will take her soccer talents to Oregon State. MAC FLORES and dad, RICHARD. 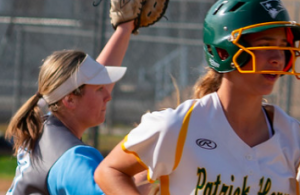 Mackenzie Flores is a multi-time All East-County player and a big part of the turnaround in the Helix Softball program as they have competed for the league championship the last couple of years, including tied for the crown the last couple of years. 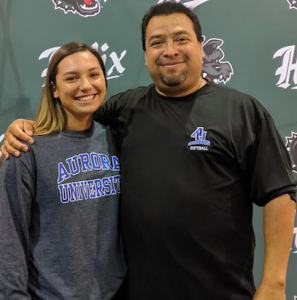 Due to her efforts, she has inked her way to a softball scholarship to Aurora (Ill.) University where she will play for the Spartans, who are in Division III. 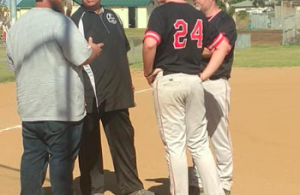 Josh McNish-Heider who was considered one of the top players in the county this past season going into the season was able to parlay his talents into a scholarship to Azusa Pacific University. 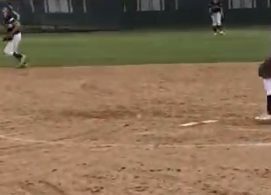 Tanner Smith who went 5-1 on the mound last season for the Norsemen has inked a baseball scholarship to Arkansas Tech University where he will play for the Wonder Boys. Katelyn DeWent and her sister Raemi DeWent who has 6 goals on the season will both take their soccer talents to Grand Valley State next season. Maddy Haugen who has scored a couple of goals this season will next year be playing soccer at University of Nebraska – Concordia. GARRETT CURRAN who was one of the big monsters on the Eagles offensive line this year and also a First Team All-CIF guy helped protect Jacob Siegfried and open up the holes. His 6’6” 285lb frame and ability to push people around helped him earn a Division I scholarship next season to Boise State University. DAVID TYLER GONZALEZ like his teammate Curran bowled over people and pushed them around which earned him All-EastCounty honors. On the season he ran for 892 yards and 9 TDs. Next season he will take his talents to the University of Utah where he will play for the UTES in the Pac-12. CHEYENNE SMITH who is one of the best goaltenders in the County as she has helped the Eagles to 10 victories so far against only 3 defeats will take her talents to Concordia next season. MALIA KEALALALUHI who has 5 goals on the season will next year take her talents to the Ivy League where she will play for Penn. HALEY WILLHELM who also has scored 5 goals this season will next year be playing soccer at CS San Marcos. AMBER HUFF who is a multisport athlete as she was the kicker on the varsity football team where she kicked 52 PATs and scored 64 points on the season will actually go to college on a soccer scholarship as she is one of the best players in the county and next year will play at UC Irvine. JOSH MOALA who caught 33 balls this past season for 445 yards and 8 scores and was an All-East County player will next season take his talents to the University of San Diego which plays in the Pioneer League. 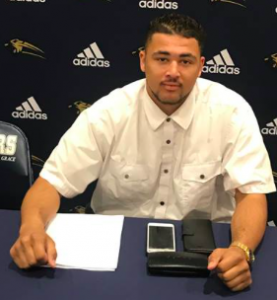 JULIAN SANDERLIN who was an All-East County player last season as he had 70 tackles and 12 sacks will next year join fellow Easterners at Dixie State. 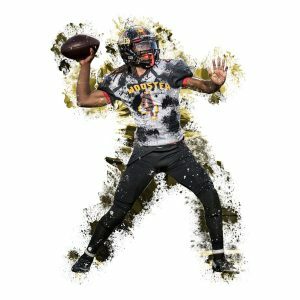 MUGABE MILLER who last season earned All-East County as he led the Mount Miguel Matadors deep into the Division III CIF Playoffs at quarterback. His talents have led him to Wooster where he will play for the Scots. SELAN CROTTY will next season take her soccer talents to Wesleyan. JALYN LUPO who on the season has scored 5 goals and has 5 assists will next season take her soccer talents to Loyola Marymount. MIKEL OLIVER was one of the big reasons why the Steele Canyon Cougars were able to move through the Division II Playoffs and claim the CIF Championship. The Cougars then played their way through the State Playoffs where they claimed a state division title. 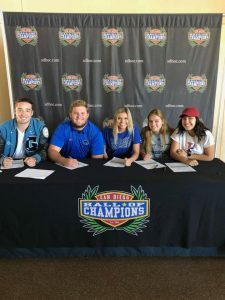 Oliver who had originally committed to play at SDSU decided to instead take his football talents to Dixie State next season and join his fellow Eastern mates. Santana athletes sign their NLIs with AD in-waiting LUKE PHILLIPS and coach SHANE CABLE. ALYSSIA ANUAT who is one of the best soccer players to play at Santana will next season take her talents to Abilene Christian University in Texas who are the Wildcats and play in the Southland Conference of Division I.
ANICIA REYES another talented player for the Sultans will next year take her skills to Mercy College in New York and play for the Mavericks who play in Division II. ASHLEY HUJING will next season play soccer at Wayland Baptist University an NAIA in Texas and will play for the Pioneers. 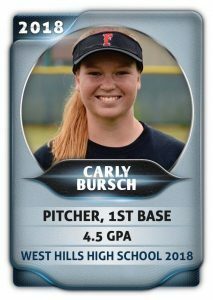 CARLY BURSCH who batted .342 last season will next season take her softball talents to Pacific University in Oregon where she will play for the Boxers. 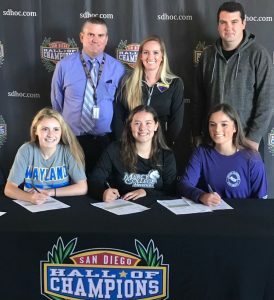 KATE HODGETTS Signed her Letter of Intent today to play for the Sonoma State University SeaWolves, and continue her education and soccer journey.